We are proud to announce the 4th edition of the I-COM Data Science Hackathon and call for challenges. The I-COM Data Science Hackathon will take place on April 6 - 8, 2018 in San Sebastian, Spain as a pre-event of the I-COM Global Summit (April 9 - 12, 2018). The I-COM Data Science Hackathon focuses on solving real problems and achieving results, often accelerating to outcomes that normally take months of work to achieve or replicate. It is a 24-hour marathon where competing teams develop algorithms using data science analytics to solve predictive modeling challenges on marketers' datasets. Your company has a possibility to submit and, therefore, sponsor the I-COM Data Science Hackathon Challenge. In 2017, the two main sponsors providing the challenges were Intel and Unilever. The Challenge should have a predictive component and be useful and valuable for marketing purposes, translate into a business action/insight and provide ample ground for interesting presentations on the main stage at the Global Summit to allow for meaningful qualitative scoring. Possible types of Challenges - attribution, connecting online to offline activities, broadcasting advertising, lifetime value measure, web analytics, loyalty of customers, online advertising, prediction, quality assessment, etc. Each suggestion will be analysed by the Data Science Hackathon Board and the two most interesting Challenges will be chosen for the I-COM Data Science Hackathon 2018. 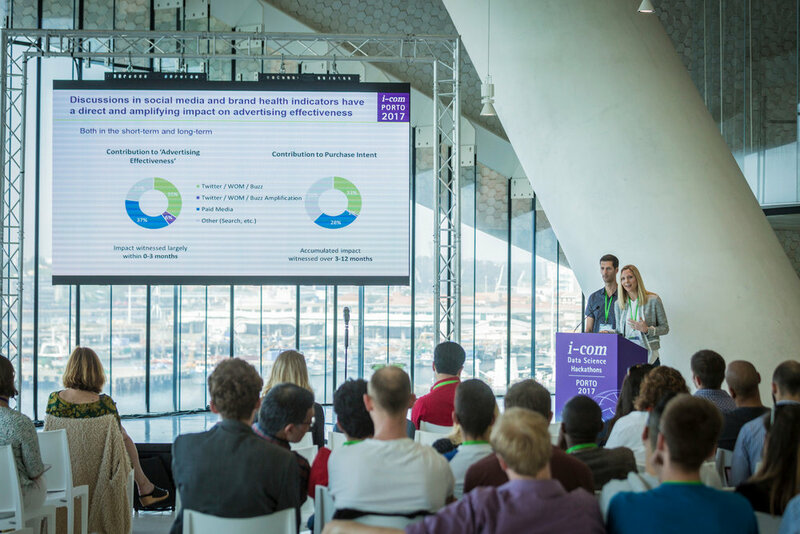 If your Challenge is chosen, a representative of your company will be invited to join the DSH 2018 Board – the decision-making body for all issues related with the I-COM Data Science Hackathon deciding on competition framework, Challenges, datasets, as well as developing a judging procedure and criteria. The deadline for suggesting a DSH Challenge is 1 December 2017.
n 2017, Google, Kantar Media, Kantar Millward Brown, Kantar Shopcom, NPD, Twitter and YouGov were Data Sponsors; and in 2018 you can join this group of leading data providers. Further more, you company can work with I-COM on bringing the university talent into the Data Science and Marketing Industry. For these and other sponsorship possibilities, please visit this page. If you wish to enter a team for the Hackathon, you can find more information here.